Surrounded by heritage trails and nostalgic sights, the Dorsett Singapore is a short walk away from Chinatown and Outram Park MRT stations. For many visitors to Singapore, Chinatown is definitely on their to-visit list as it boasts a myriad of old architecture and delicious foods. For the residents of Singapore, the Chinatown area is a place for fantastic local food (if you know where to look) and excellent restaurants. Enjoy affordable and delicious local food at Tong Ah Eating House along Keong Saik. If you're after something fancier, try Burnt Ends on Teck Lim Road or the relatively new Three Buns by Potato Head Folk. If you up for a different kind of experince, find yourself in a speakeasy bar that is hidden away behind the shelves of a reference library (the password changes from time to time though). After passing by the Dorsett Singapore hotel a couple of times, I have decided to check out the newest addition to the property, the Loft Rooms. Designed to maximise space, the layout of the room is simple but cleverly positioned. While a room size of 25 sqm does not seem like a lot, there is a mezzanine level which allows for a separate work and living space. The room comes equipped with two LCD TVs that are situated on the first floor in the living area, and on the second level where your bed is at. There is a good range of international and cable television channels so don't be afraid that you will get bored. Complimentary water is also provided in the room. The bathroom is pretty basic and you should not expect to find a bathtub here. After all, lofts are all about making clever use of limited space. The toiletries are provided by an in-house brand and had rather suspicious-looking packaging. You will find an extremely high rain shower here that by far simulates a rain shower perfectly. Some hotels have the rain shower head at approximately 30cm from the top of your head which practically renders it useless. Rest assured that the rain shower head is placed high enough (since there's ample headroom in the Loft Room) for a great showering experience. There are probably approximately 15 steps to reach your bed so if you have difficulty climbing up stairs, I would definitely suggest you stay clear away from this room - check out the Splash Room that they have instead! While my room was located on the second floor, the soundproofing was done pretty well so I was not affected by the noise on the streets at all. The huge glass windows are great for you to people watch from the stairs or your bed. Automatic curtains that can be controlled by switches located by the bed and the lower level are easily accessible. I did however spend a couple of minutes trying to figure out how it works - they are more complicated than it looks. Like most lofts in Singapore, the second level usually contains only a small space so do not expect to find another 25sqm located above. The King-size bed featuring a Sealy Posturepedic mattress was a delight to sleep in. Considering that this is a four-star business and leisure hotel, I did not have high expectations for the bedding but I was pleasantly surprised. The curtains also did a relatively good job at blocking out the light in the morning to ensure that you get more than sufficient sleep. If you fancy a swim (and you should, considering how humid Singapore is), there's a pretty long (30m) lap pool and an outdoor Jacuzzi for you to idle your time away in the sun. Ample tanning decks are also available along the pool side so you can get your healthy dose of Vitamin D in the morning or early evening. The pool is a shared facility with Dorsett Residences so you will actually find some apartments with direct pool-access. You will also find a decent-sized gym located next to the swimming pool so you can be sure to shake off those calories from the restaurants I have mentioned earlier. One thing that baffles me in this hotel is the existence of this roof garden. While there are amazing views of old shop houses and the iconic Pinnacle at Duxton from here, I can not quite fathom the purpose of this area. Perhaps for those that practice yoga, this area could be an excellent spot in the early morning. That being said, it will definitely be interesting to see this place transform into an enviable event area should that day come. 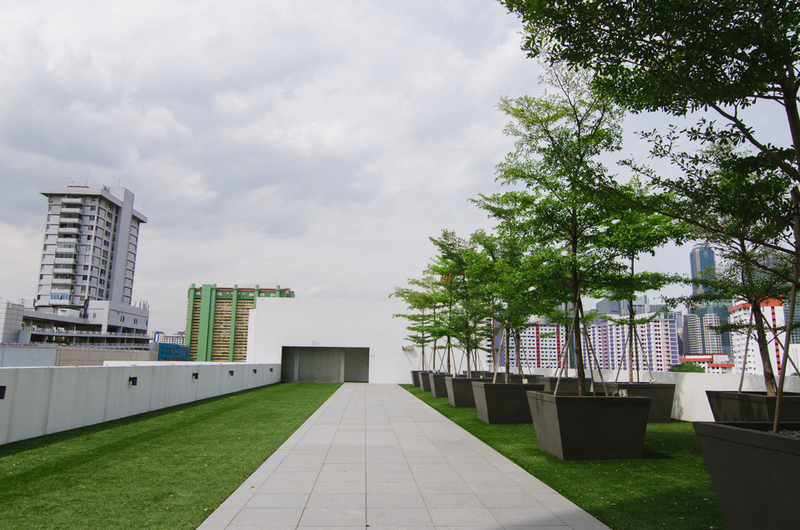 If you are staying in Dorsett Singapore, pop by the roof garden anyway to take some photos of the surroundings. I can't promise that it will be enjoyable in the afternoon considering the lack of foliage but it is definitely a vantage point to capture enough details of Chinatown and Outram Park. As the room did not come inclusive with breakfast, I chose to have my breakfast at the Pappasan Restaurant the following morning. Claiming to be a contemporary and modern restaurant that features local and European cuisine, Pappasan Restaurant did not particularly impress me during breakfast service. While I did not expect the food variety to rival that of Pan Pacific Singapore or the Mandarin Oriental Singapore, the selection of food was quite limited. There was a selection of a few hot food items ranging from crumbed fish, sausages, fried noodles, samosas, noodles and ham. If you are living in Dorsett Singapore, it may be a good idea to explore the area outside and indulge in some local breakfast instead. After all, there is plenty of good food outside to choose from in the Chinatown area! Besides, as a hotel guest, you will also receive a range of dining benefits at participating restaurants nearby. The Loft Rooms are a nice addition to the Dorsett Singapore which is located in a rather strategic location. The Loft Rooms go for S$290++ (S$341.33 after taxes) a night under a flexible rate that offers free cancellation. Advance purchase rates give you 10% off BAR for limited room types. If you are considering this property for a weekend staycation, be sure to take advantage of the Super Weekenders rate which starts from S$160++ only. Hotel stay has been sponsored by Dorsett Singapore, though all views expressed are my own.